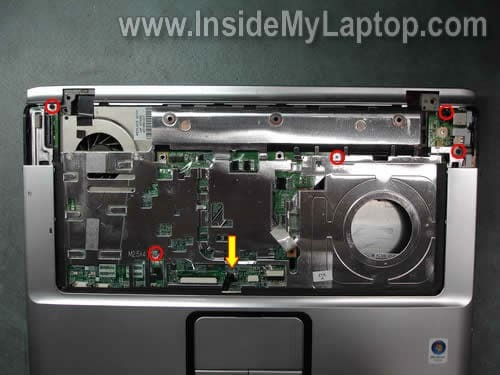 Remove four screws securing the hard drive and memory (RAM) covers. Remove both covers. 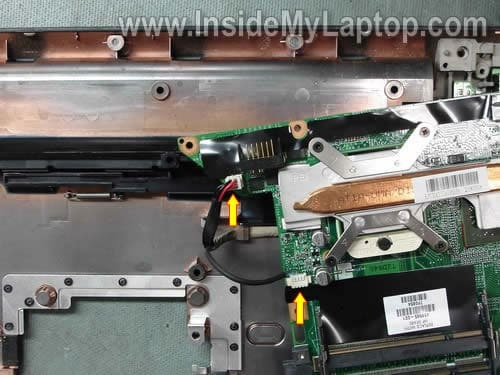 Lift up the right side of the hard drive assembly to disconnect it from the motherboard. 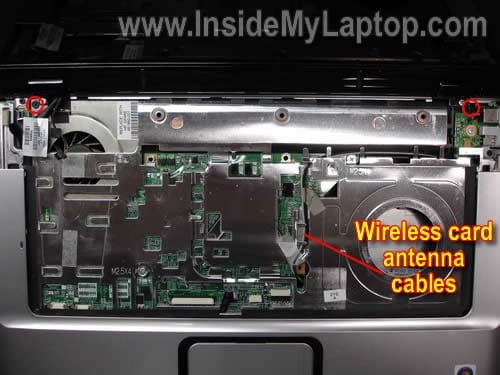 Disconnect two antenna cables (black and gray) from the wireless card. 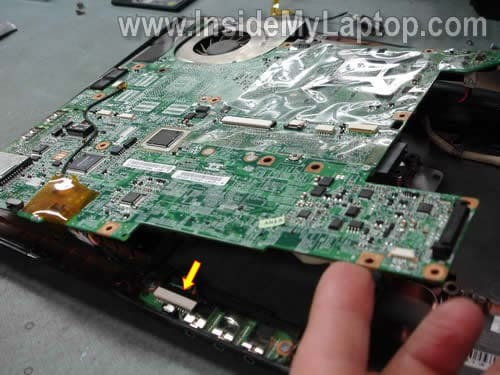 Remove two screws securing the wireless card to the motherboard. Remove the wireless card. By the way, in this step you can access the CMOS (RTC) battery. 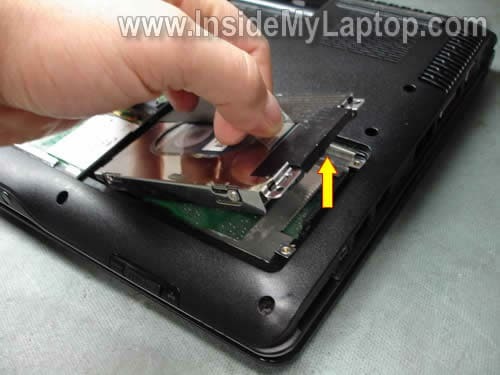 Remove one screw securing the CD/DVD drive to the laptop base. 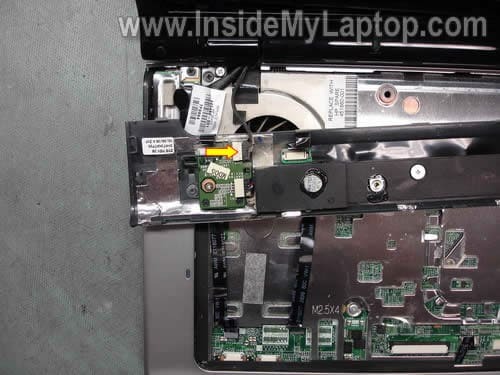 Pull the CD/DVD drive from the notebook and remove it. 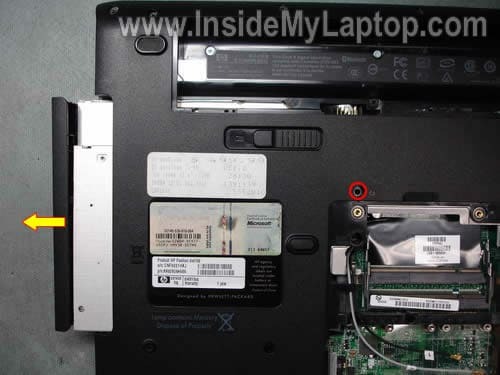 - three screws in the CD/DVD drive bay (yellow). 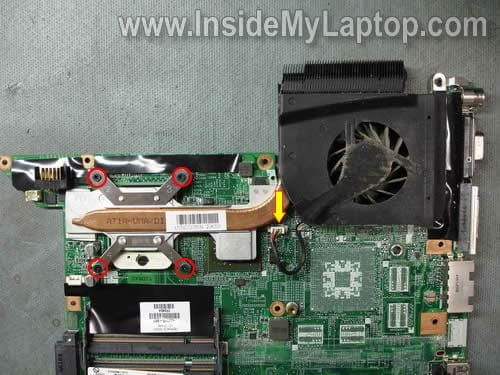 - one screw in the hard drive bay (green). - two hex studs under memory slots (orange). 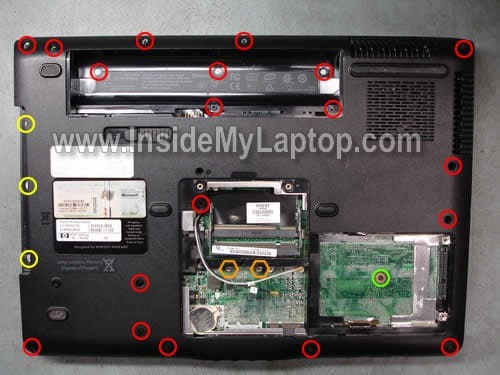 Mark all removed screws somehow so you don’t forget their location when assemble the notebook back together. 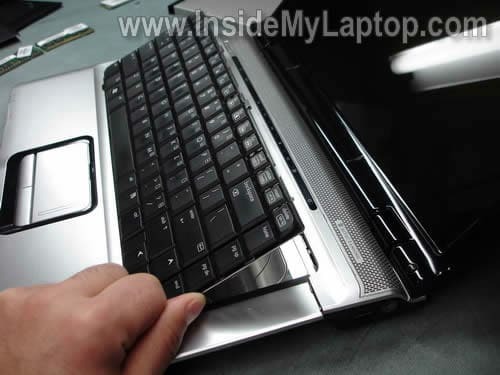 Carefully lift up the right side of the power button board cover. There are two cables connected to the motherboard. We’ll disconnect these cables after removing the keyboard in the STEP 8. 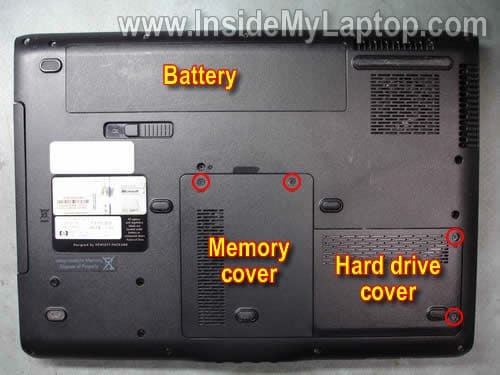 Now, when the power button board cover separated from the laptop case, you can remove the keyboard as it shown on the picture below. 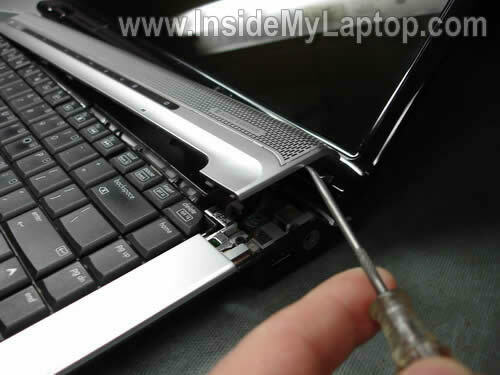 Carefully disconnect the keyboard cable from the motherboard. 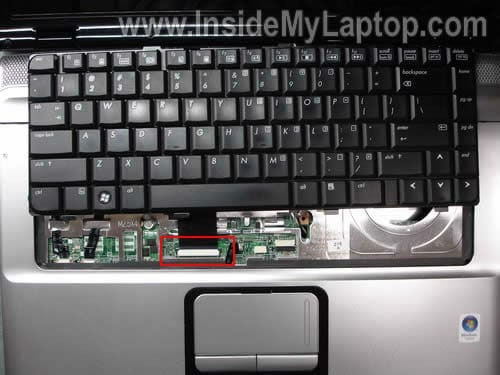 For more detailed keyboard removal instructions please follow this guide for HP Pavilion dv6000 laptop. 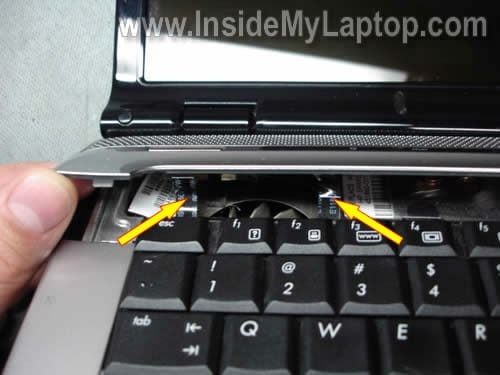 These instructions should be identical for HP Pavilion dv6500, dv6600, dv6700, dv6800 notebooks. Disconnect two cables running from the power button boar cover. There are no locks on these connectors. Simply pull both cables from connectors. Turn the cover upside down and disconnect one cable from the power button board. 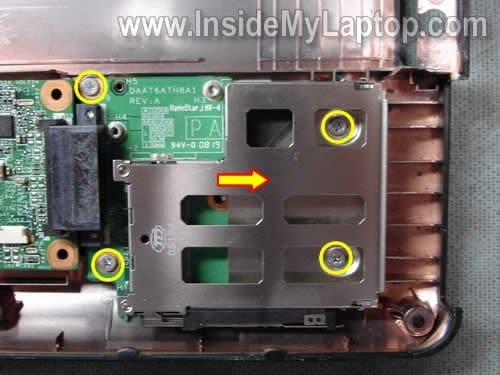 This connector is located close to the left display hinge. 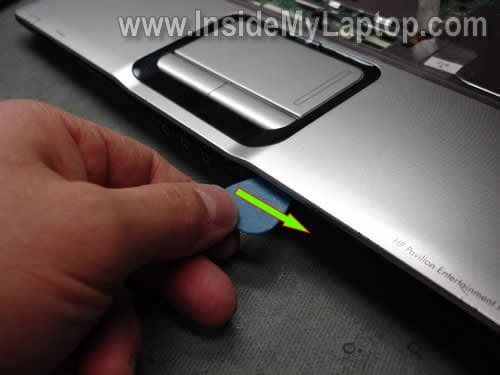 Pull both wireless card antenna cables through the opening in the top cover. Unroute both antenna cables. 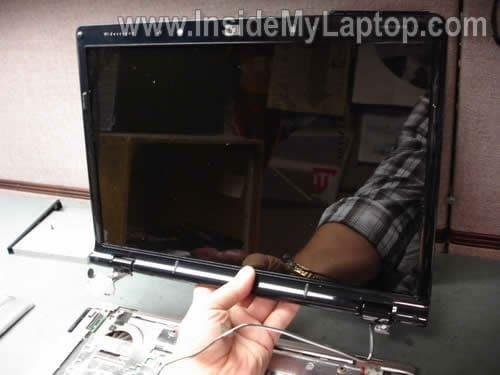 Lift up and separate the display assembly from the notebook base. 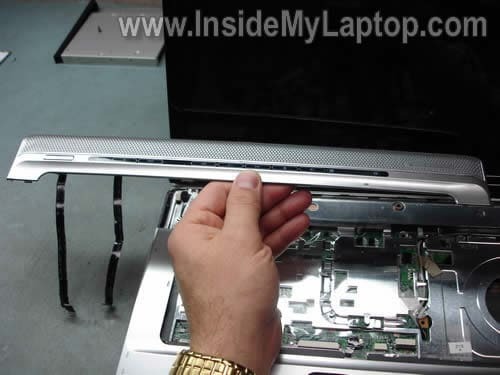 In one of the previous posts I explain how to disassemble the display assemble and remove the LCD screen from an HP Pavilion dv6000. 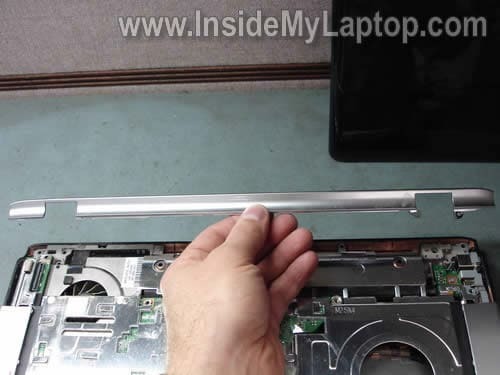 Start separating the plastic cover from the notebook base. You can use a piece of soft plastic (I’m using a guitar pick) to separate the cover from the base. 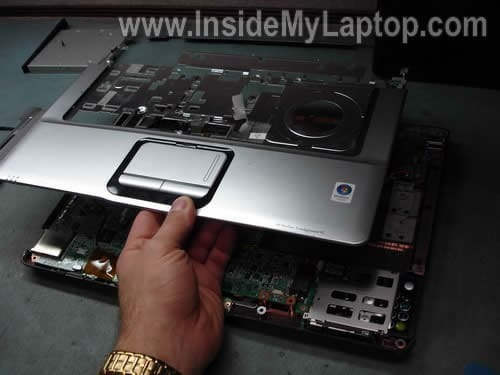 Separate the top cover assembly from the notebook base. Again, as a case cracker I’m using the same guitar pick. 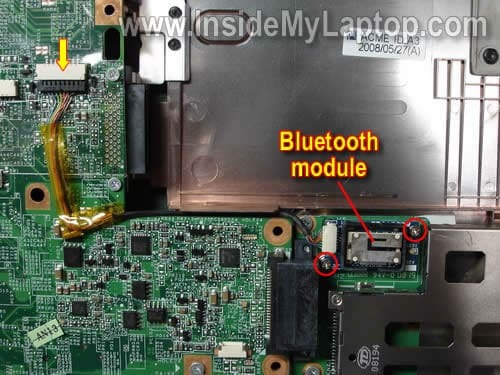 Disconnect the Bluetooth module cable from the motherboard. 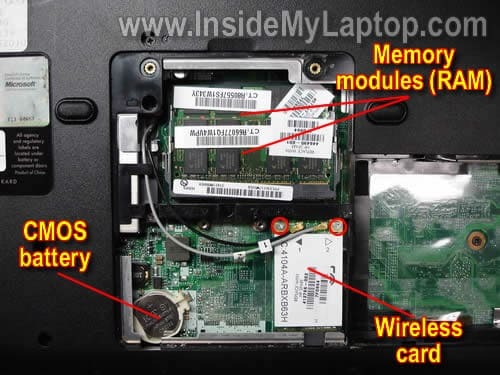 Remove two screws securing the Bluetooth module. 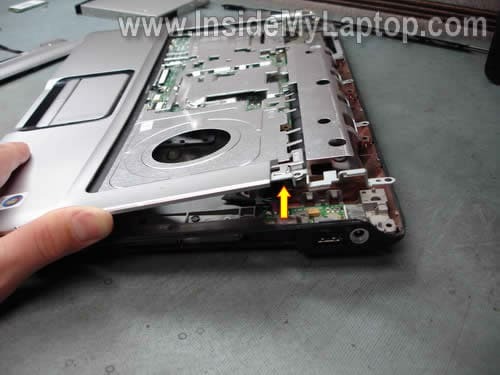 Remove four screws securing the express card slot. 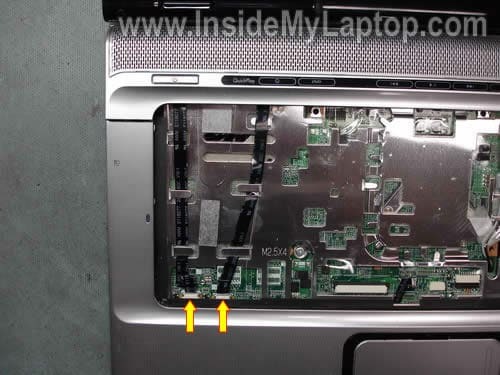 Slide the slot board to the right and disconnect it from the motherboard. 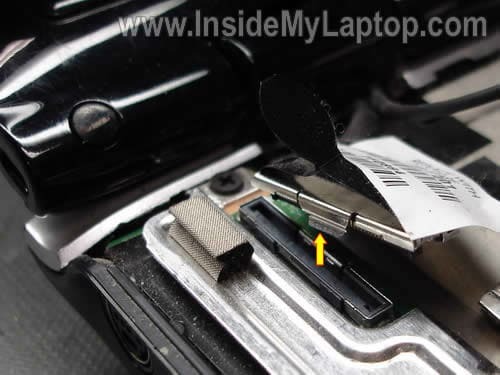 There is only one screws securing the motherboard to the notebook base. 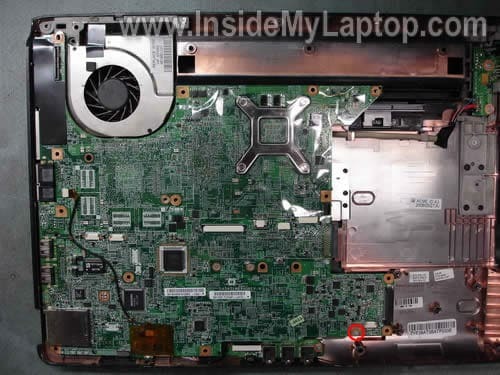 Start removing the motherboard as it shown on the picture below. When the motherboard is lifted up, disconnect one cable from the audio board. There are two more cables connected to the motherboard and we’ll remove them in the next step. Turn the motherboard upside down and disconnect two more cables. 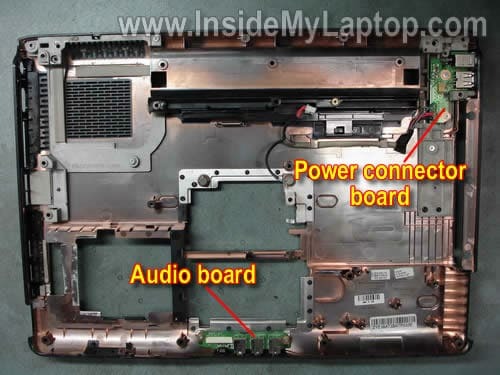 The audio board and power connector board are still connected to the notebook base. Loosen four screws securing the cooling assembly (heat sink and fan) to the motherboard. 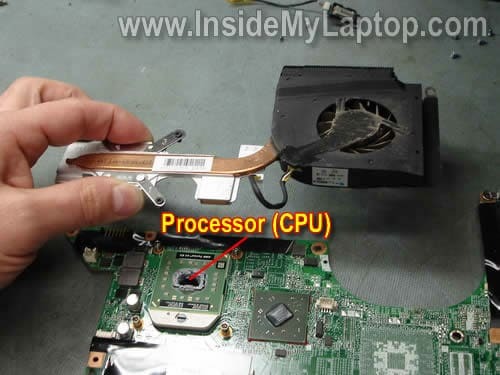 Lift up and remove the cooling assembly. 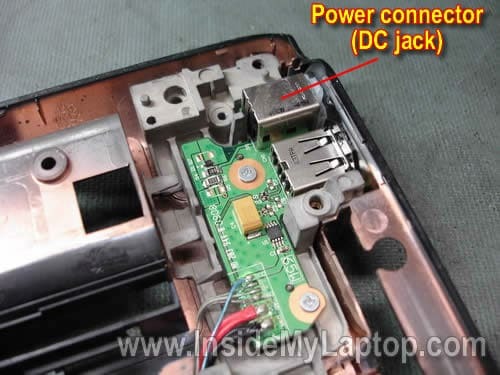 In this model the power connector (DC power jack) is not soldered directly to the motherboard. The power connector is mounted on a separate board. If the power connector fails, you can desolder it from the board and replace with a new one or replace the entire power connector board.